Each channel page consists of several basic sections: the chat box, the video, the playlist controls, the playlist, and the poll area. 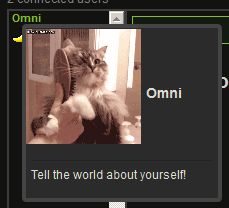 The chat box allows you to communicate with the other users in the channel. At the top, there is a bar with the number of connected users. Clicking this will hide the userlist to expand the message area. The userlist consists of all the names of users in the channel who are logged in. Right click a name to pop up available actions for that user. If you are not a moderator, you can ignore the user or send them a private message. Moderators can use this menu to kick, ban, and perform other moderating tasks. At the bottom, there is a chat input bar. If you are not logged in, it will prompt you to choose a guest name. After logging in, simply type your message in the input box and press enter to send it. Certain types of messages will be interpreted as commands, which will be covered below. The playlist is a list of videos that will be played in order from top to bottom. Each entry will display the title and duration of the video. Each item has a few buttons to perform certain actions, the location of which depends on your user preferences. Click and drag playlist items to rearrange the order. The poll area allows moderators to conduct polls. When a moderator opens a poll, a poll box will be added to the poll area. Each option in the poll has a button next to it for you to select that option. Each IP address can only vote once, and your vote is cleared when you leave the page. The buttons next to each option will display the number of votes for that option. If it displays "? ", then the poll opener has elected to hide the poll results until the poll is over. At the top of the page, you should see a button labeled "Options". 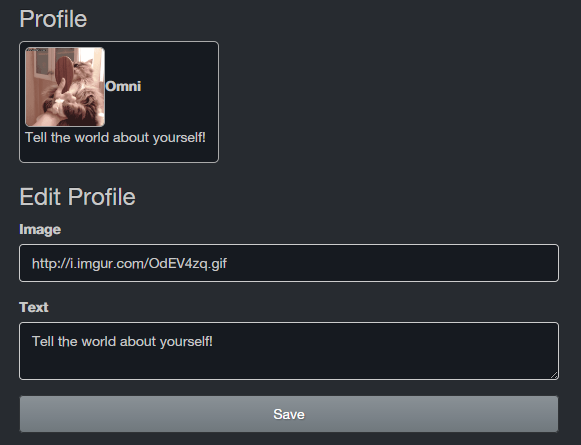 This will open a dialog that allows you to configure various personal settings. These are divided into 4 categories. The theme selector allows you to choose a different colorscheme for the site. By default there are 4 themes. Slate and Cyborg are both dark themes, Light is a flat, light colored scheme, and Bootstrap is the same colors as Light but with added gradients. The layout selector changes how the elements on the page are positioned and sized. Compact and Fluid have chat on the left, video on the right, and polls and the playlist below. Synchtube and Synchtube + Fluid are the same as Compact and Fluid except reversed- chat is on the right with video on the left. Fluid and Synchtube + Fluid will expand the chat and video to fill the width of your screen, whereas Compact has a static size. HD places video on top, then the playlist and chat side by side, then polls below chat. CyTube includes the ability to style channels with CSS. However, you can use this option to override these changes and use the default CSS. This option is deprecated. Instead, the client will automatically connect using SSL if the server supports it. This checkbox controls whether or not your video will be synchronized with the server. This is the number of seconds representing how close your video will be synchronized with the server. For example, with the default value (2), your video will only be forced to re-sync if it is at least 2 seconds ahead or behind the server. Smaller values indicate more accurate synchronization, but may cause a lot of unnecessary seeking interrupting the video. If you're having trouble with a slow connection, you may want to increase this setting to 5 or 10 seconds. The wmode=transparent parameter on the video player allows elements to be rendered over the video like normal. However, on some implementations of Flash (e.g. Linux), this is extremely laggy, so I added this option to force an opaque wmode. Since Vimeo banned cytu.be from embeds, Vimeo playback is currently supported via direct links to h.264 encoded video files. Some browsers, including Chrome and as of version 29, Firefox, support native h.264 playback via the <video> tag. However, others must rely on a third-party Flash plugin to decode the video. CyTube attempts to autodetect whether your browser supports native playback, but if Vimeo videos aren't loading, you can try manually enabling this setting. This option will automatically remove the video player every time you load a channel. Useful if you're using CyTube on a computer or in a location where you don't want the video present. You can do a 1 time removal of the video by clicking Layout -> Remove Video from the top of the page. Instead of "Play / Queue Next / Make Temporary / Delete" buttons being visible on every playlist item, they will start out hidden. You can then right click a playlist item to expand the buttons, and right click it again to hide them. This is a legacy feature for people who prefer the icon-style playlist buttons from CyTube 1.0. This dropdown allows you to select the quality parameter passed to the player when it loads a video. If enabled, prepends a timestamp of the form [HH:MM:SS] to the beginning of each chat message with the time it was sent. If enabled, all admins will be sorted to the top of the userlist, followed by moderators, followed by regular users, followed by guests. Within each rank group, names are sorted in alphabetical order. If enabled, users marked as AFK will appear at the bottom of the userlist. This option controls whether the page title will flash (alternates between chatroom title and *Chat*) when certain conditions occur. If set to 'always', it will flash on every new message. If set to 'only when I am mentioned or PMed', it will only flash if your name is present in the message, or the message is a PM. If set to 'never', the page title will not be flashed for any message. Please note this applies only when CyTube is not the active window. Same as above, but for playing a notification sound. /me <message> - Sends a message as an action, for example calzoneman gets a snack. /sp <message> - Hides a message in a hover-to-expose spoiler box. /afk - Toggles your AFK status. You will automatically be marked not AFK after sending a chat message or voteskipping the video. Custom embed - Paste the <iframe> or <object> code in the Custom Embed box and click next or end. Direct link video/audio files - Requires ffmpeg to be enabled on the server. Supported file types are webm, mp4 (h264), ogg/theora, ogg/vorbis, mp3. Google Docs videos must be 59 minutes or less in order to be played. If you need help, feel free to join irc.6irc.net#cytube. calzoneman and nuclearace are the people to look for. If no one is around, you may email cyzon@cytu.be or nuclearace@cytu.be.